Minions is a harmless but still average film that kids will certainly love. That said, this is something that probably would’ve worked better as a short for either a TV special or showing prior to the eventual Despicable Me 3 theatrical release. 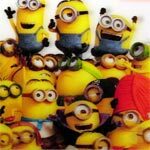 Minions, which takes place in the ‘60s, centers around three of the thousands of little yellow guys: Kevin, Stuart and Bob. The tribe of minions is without an even genius to serve so the three set out to find a new master after going through a variety including Dracula and Napoleon. Their travels take them around the world before arriving in New York City. When they see an advertisement for Villain-Con taking place in Orlando, a convention where supervillains gather to trade services and introduce devices. 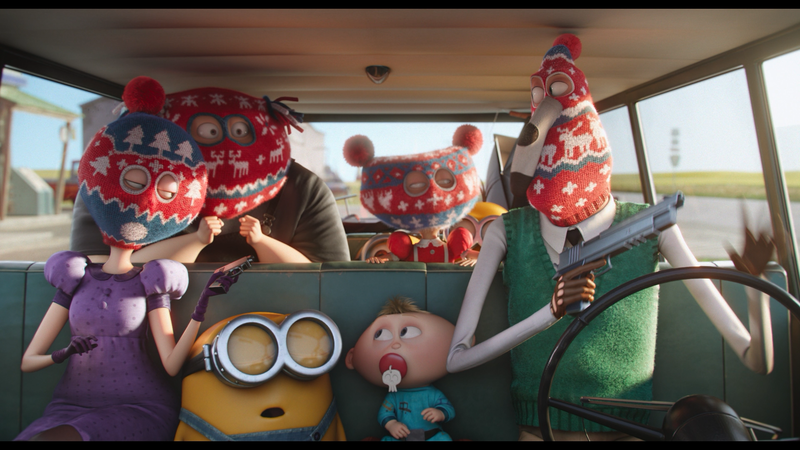 The minions hitchhike a ride from a seemingly normal family, the Nelsons — father Walter (MICHAEL KEATON), mother Madge (ALLISON JANNEY) and their three children — but this is no normal family as they turn out to be villains as well and also happen to be going to Villain-Con. 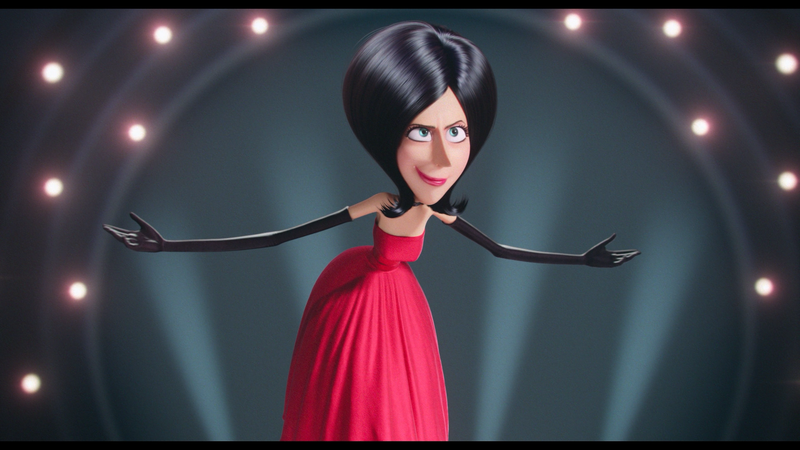 Once there, the minions explore all that the convention as to offer but their ultimate dream to be henchman to the keynote speaker, Scarlet Overkill (SANDRA BULLOCK). During her grandiose and glorious speech, she offers the opportunity to anyone in the audience to serve has her henchperson if they can grab a prize from her hand and after unsuccessful attempts by others, the minions manage to stumble upon winning the contest. Scarlet and the three jettison off to London where their work begins. Along with her inventor husband, her villainous master plan is to steal the St. Edward’s Crown from Queen Elizabeth and for whatever reason, when she possesess it, Scarlet will become the new Queen of England… Of course, the minions aren’t the most, well, competent fellows and botch the crime but, as always, stumble upon some sort of success when Bob manages to lift the sword Excalibur and he now is the ruler of England, something that infuriates Scarlet. Now she’s out to retrieve her place on the throne and become the world’s best supervillain. Sometimes cute side characters should remain just that, side characters. While it kind of worked in Penguins of Madagascar mainly because our three main characters could actually speak English (or dubbed in other countries), the Minions are more limited in what they can do and rely on the humans to further the story, at least in feature film form; which is why they’re used just right in the Despicable Me movies where Gru and his family are the main characters. But with Minions, it’s a nice concept but the execution wasn’t the best and what should’ve been a 20-minute short film that premiered before the eventual Despicable Me 3 outlasts its welcome probably halfway in. In the end, Minions isn’t a horrible film and I’m almost certain younger viewers (under 12 I’d say) will love it but for adults it does become a bit tedious to sit through however by the same token, it’s not unbearable. The voice acting is decent with Sandra Bullock and Michael Keaton having a grand old time. This release comes with a lenticular slip cover. Inside is a redemption code for the Digital HD copy as well as standard DVD Copy. Deleted Scene (0:29; HD) – There’s only one scene included, entitled ‘Me, Myself and Stuart’. So short, I’m not sure why it was removed. Around the World Interactive Map allows viewers to look at the different places the minions visited in the film and watch different scenes or check out photo galleries of concept art and other items. Behind the Goggles: The Illuminating Story of the Minions (TRT 30:23; HD) are a series of featurettes outlining the origin of these characters and giving them their own movie from the writing, the building of Illumination Entertainment, art department, the score, cast interviews (Bullock, Ham, Keaton, Janney), concept art and other areas. 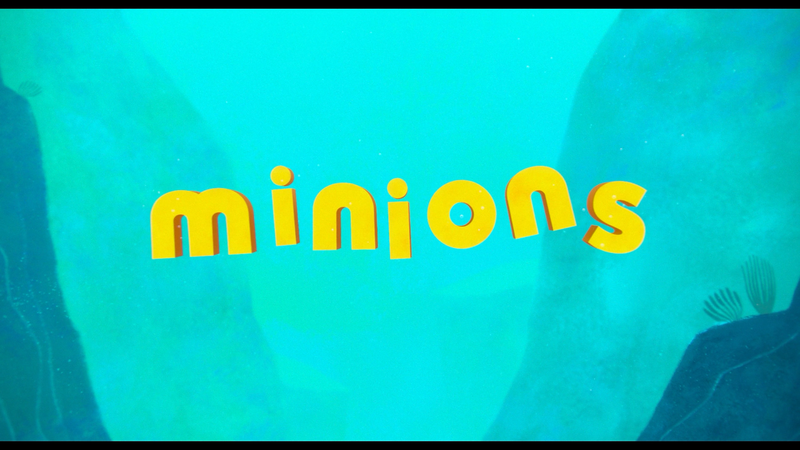 Jingle Bells Minion Style (1:52; HD) is merely the classic Christmas song sung by the little yellow guys. Also included are 3 Mini-Movies: “Gro Minion” (4:25; HD), “Competition” (3:47; HD) and “Binky Nelson Unpacified” (4:34; HD). 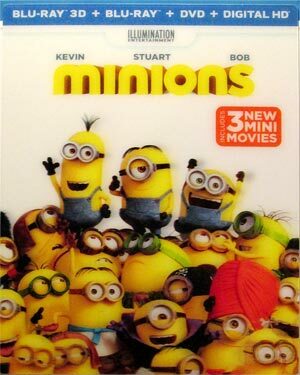 Universal Studios Home Entertainment releases Minions onto Blu-ray presented with a 1080p high-definition transfer and show in its original 1.85 widescreen aspect ratio. Not surprisingly, this looks brilliant in HD with amazing colors that pop off the screen extremely well. It’s also a very clean transfer with no major instances of artifacts or aliasing. The 3D transfer is equally to task with amazing depth throughout and as with the majority of other animated 3D releases, this tends to take full advantage of the technology by not only providing for great depth perception but also keeping the bright colors. 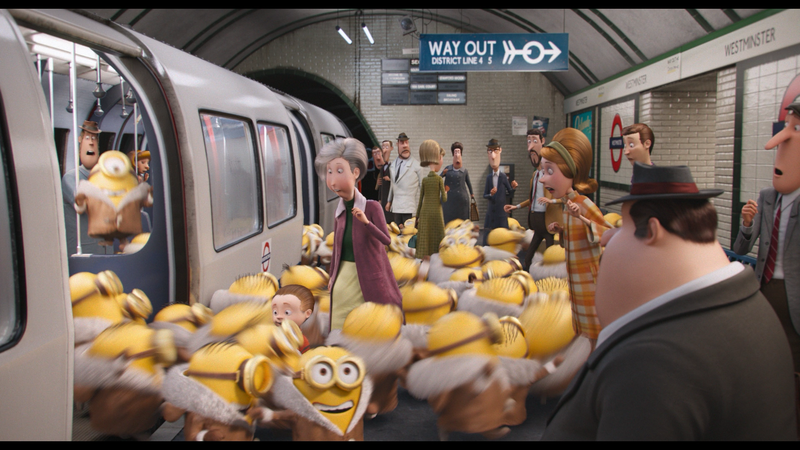 There were several scenes that stood out (literally) including the flyover shots in London as well as when we see thousands of minions on screen together. Action sequences also come across well with no jittering or ghosting presenting smooth motion from shot to shot. The movie comes with a robust Dolby Atmos (TrueHD 7.1 for systems unable to decode) and unsurprisingly it sounds fantastic. Dialogue, such as it is for the minions part, is crisp and clear but the track especially comes to life with the various action-oriented sequences showing off great depth throughout. This is yet another incredible lossless track and one of the better ones for an animated film. 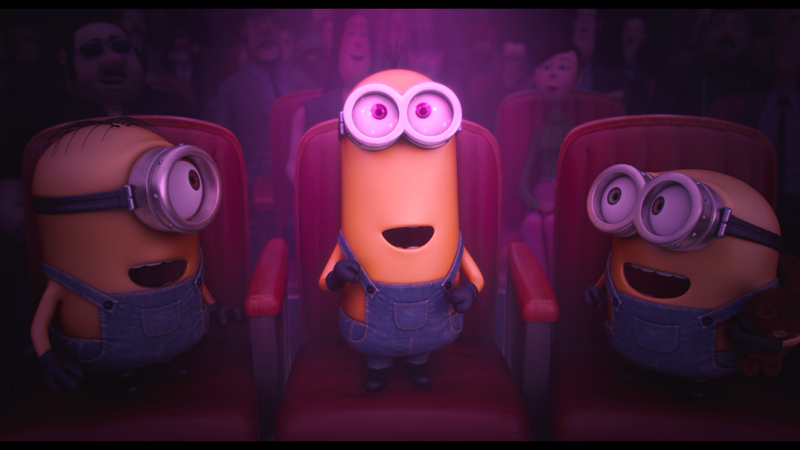 Overall, Minions is a harmless but still average film that kids will certainly love. That said, this is something that probably would’ve worked better as a short for either a TV special or showing prior to the eventual Despicable Me 3 theatrical release. Still, the disc at least has amazing video and audio and a OK selection of bonus material to check out.